LGBT Employees Protected By Federal Civil Rights Act, Appeals Court Rules : The Two-Way The 7th Circuit Court of Appeals ruled 8-3 that denying a teacher a job because she is lesbian violates the Civil Rights Act. It's the first time the law has been found to cover the LGBT community. A federal appeals court ruled Tuesday that the 1964 Civil Rights Act protects LGBT employees from workplace discrimination, setting up a likely battle before the Supreme Court and gay rights advocates. 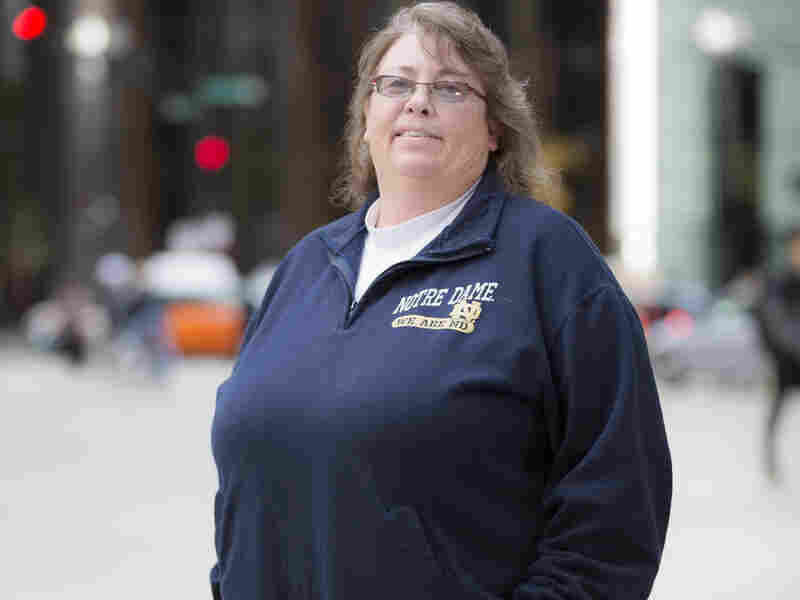 Indiana teacher Kimberly Hively, shown here in 2015, filed a lawsuit alleging that Ivy Tech Community College in South Bend didn't hire her full time because she is a lesbian. As NPR's Nathan Rott reports for our Newscast desk: "The decision comes just weeks after the 11th Circuit Court of Appeals [in Atlanta] ruled the opposite way, saying that Title VII [of the act] does not bar discrimination based on sexual orientation." In that case, as reported by NPR's Carrie Johnson, "a security guard sued her employer for harassment and for allegedly forcing her out of a job at Georgia Regional Hospital because she's lesbian and 'gender-nonconforming.' "
The Chicago-based 7th Circuit "is considered relatively conservative and five of the eight judges in the majority were appointed by Republican presidents, making the finding all the more notable," according to The Associated Press. Lambda Legal, which handled Hively's lawsuit, said the school denied her a full-time job after she was seen kissing her then-girlfriend in the parking lot of the school. The group says the appeals court ruling "could change the national landscape of employment law for LGBT people." Writing for the majority, Chief Judge Diane Wood said Hively's case was covered under the law because it "is no different from the claims brought by women who were rejected for jobs in traditionally male workplaces, such as fire departments, construction, and policing. The employers in those cases were policing the boundaries of what jobs or behaviors they found acceptable for a woman (or in some cases, for a man)." In dissent, Judge Diane Sykes said the law doesn't spell out protections for LGBT workers. "We are not authorized to infuse the text with a new or unconventional meaning or to update it to respond to changed social, economic, or political conditions," she wrote.